WRAP UP Your Christmas List with Joann's Fudge! There is still time to order Joann’s Fudge for Christmas! Our old-fashioned, hand-paddled fudge is the perfect gift for everyone on your list - so WRAP UP your Christmas List for 2018 and order Joann’s Fudge. HURRY! Last day to place your order is December 17th! Christmas Fudge will ship by December 19th - just in time for everyone to enjoy Joann’s Fudge for the holidays. Believe in the Magic of Christmas Fudge! Joann’s Fudge from Mackinac Island is the perfect Christmas gift for everyone on your Christmas List! We gather the team - and all come together for a couple weeks in December - to put on Christmas music, fire up the copper kettle, and hand-paddle fresh fudge on a marble table for all of our Joann’s Fudge loyal customers. There are still remaining two convenient shipping dates for Joann’s Christmas Fudge, so that your fudge can arrive fresh at exactly the perfect time. Peace, Love, and Christmas Fudge! Our old-fashioned, hand-paddled fudge is the perfect gift for everyone on your Christmas List! 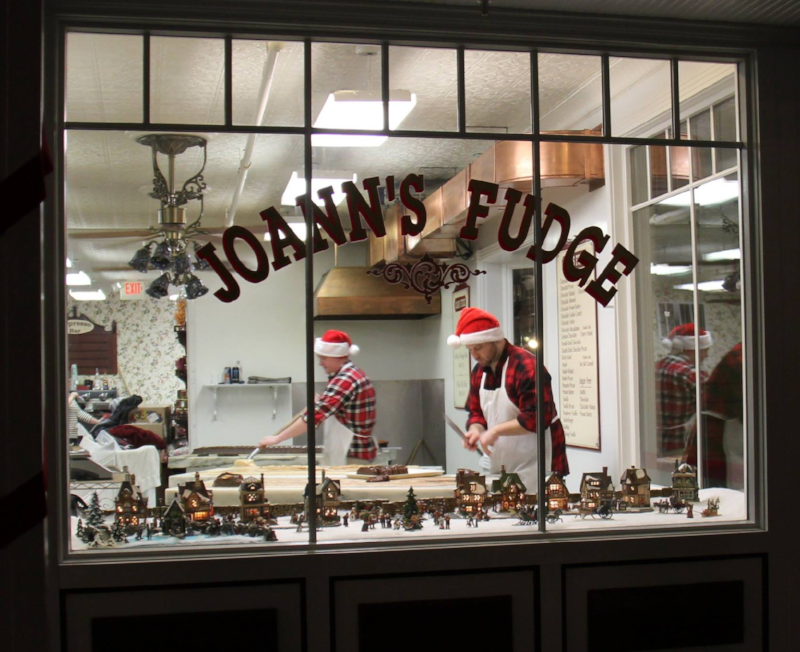 Joann’s Fudge has been the best on Mackinac Island since our family opened our first fudge store almost 50 years ago. Recently, The Daily Meal voted us “America’s Best Fudge Shop”, stating “The fudge here is classic and simple, and just about perfect.” Choose from three holiday delivery options, so that your gift arrives fresh from Mackinac Island at exactly the right time. Treat the Family to Joann's Fudge for Thanksgiving! Joann’s Fudge from Mackinac Island is the perfect addition to your Thanksgiving dessert menu! Treat the family to a fun daytime treat while watching football, cooking, and hanging out together. Or make a selection of fudge a featured dessert after Thanksgiving turkey. It’s a great way to celebrate all the things you love most - Family and Fudge! Treat Dad to Joann's Fudge for Father's Day! Treat your Best Dad to Joann's Fudge for Father's Day! Joann's Fudge is an affordable and thoughtful gift for the special guy in your family. Our old-fashioned, hand paddled fudge is made fresh daily on Mackinac Island and Mackinaw City. We are a three-generation family business that started in 1969. Today all three generations work together to make Joann's Fudge "America's Best Fudge Shop". We hope you can bring Dad to visit us in person. But even if you can't make the trip to Mackinac this month, you can still surprise Dad by ordering Joann's Fudge online. Mother's Day is the special time of year when we pause to celebrate the most important woman in our lives. Our mother is our first teacher, our truest friend, and our biggest fan. In the Joann's Fudge Family, Joan (Joann) Nephew has been the best friend (and cheapest therapist) to four children and seven grandchildren. We've had the great fortune to have all three generations work together at various times on Mackinac Island. We have kept our organization small, from one store in 1969 to three stores today, so that our commitment to quality can be personally supervised on a daily basis. You still have time to order Joann's Fudge for Christmas! Order by 5 pm on Monday, December 18th - and your fudge will ship by Wednesday, December 20th! Joann's Fudge has gifts ranging from $8.50 for a One Slice Box - to $29.50 for a Deluxe Five Slice Box. So you can find the perfect gift for everyone on your list. Don't forget to order some for yourself. Every family Christmas celebration should include some old-fashioned, hand-paddled Joann's Fudge from Mackinac Island. Celebrate Christmas with Joann's Fudge! Joann's Fudge is the perfect gift for everyone on your holiday list. Our old-fashioned hand-paddled fudge has been the best on Mackinac Island since our family opened our first fudge shop almost 50 years ago. Joann's Fudge is a family owned and operated business, with three generations working together to maintain our commitment to quality. Thanksgiving is a Perfect Time for Joann's Fudge! Put Joann's Fudge from Mackinac Island on your Thanksgiving dessert menu this year! Joann's Fudge is a perfect addition to any family gathering - as a snack during the day while watching football and cooking - or as a featured dessert after the Thanksgiving turkey. It's a great way to celebrate all the things you love most - Family and Fudge! Joann's Fudge makes the Perfect Gift for Father's Day! Thank Dad for everything he's done for you by surprising him with Joann's Fudge for Father's Day. Our old-fashioned, hand-paddled fudge is made fresh daily on Mackinac Island and Mackinaw City. In 1969, Frank Nephew and his wife Joan opened the first Joann's Fudge Shop. Today all three generations work together make Joann's Fudge "America's Best Fudge Shop". We hope you can visit us in person. But even if you can't make a special trip to Mackinac, you can order Joann's Fudge online, so you can make sure your BEST DAD is surprised with Joann's Fudge for Father's Day. Make Mother's Day Happy with Joann's Fudge! We love Mother's Day! Our Mom's are our biggest fan and truest friend. A million little moments add up to a lifetime bond that can't really be put into words. There is no one more important in our Joann's Fudge Family than Joan (Joann) Nephew, mother of four, grandmother of seven, and best friend to all of us. Frank and Joan Nephew opened their first Joann's Fudge store on Mackinac Island in 1969, and today it is a three generation family business that continues the tradition of high quality and all natural ingredients, recently earning the title of America's Best Fudge. Believe in Santa - But Order Joann's Fudge! Joann's Fudge is the perfect gift for everyone on your list! There is still time to order fudge for Christmas. Our fudge is being made fresh on Mackinac Island this week - so that your friends and family can have old-fashioned hand-paddled fudge for the Holidays! Our final shipping date is December 21st. Please place your order by December 18th. Tis the Season for Joann's Fudge! Our old-fashioned hand-paddled fudge on Mackinac Island is the perfect gift for everyone on your Holiday List! Every December, we call in the elves, fire up the pots, and get to work making America's Best Fudge. Choose from One Slice, Two Slice, Three Slice, Four Slice, or Five Slice Christmas Box options to customize your gift to fit your budget. Our two delivery date options make sure your fudge is delivered at the perfect time! Joann's Fudge has Gifts You'll Want To Get this Christmas! Joann's Fudge is the perfect gift for everyone on your Holiday List! Our old-fashioned hand-paddled fudge has been the best on Mackinac Island since our family opened our first fudge store almost 50 years ago. Our store is a family run, three generation business, and all three generations work together to maintain our outstanding quality and consistency over the years. That's why The Daily Meal voted us America's Best Fudge Shop and described Joann's Fudge by saying, "The fudge here is classic and simple, and just about perfect." Put Joann's Fudge on your Thanksgiving Menu: Joann's Fudge Chocolate Salted Caramel Brownies AND Pumpkin Pie Fudge! Joann's Fudge is the perfect solution for easy (and delicious) Thanksgiving desserts! Instead of the same boring Pumpkin Pie, this year serve Joann's Pumpkin Pie Fudge. We guarantee everyone will love this new dessert. Still the same great pumpkin taste, with the smooth consistency of our creamy fudge. For a special dinner, we recommend putting a piece of fudge on a small square of graham cracker and topping with whipped cream. Once you try this, we promise you will want to make it an annual tradition! So let Joann's make your "Pumpkin Pie" this Thanksgiving! Fall in Love with Joann's Fudge! Fall is our favorite time of year at Joann's Fudge on Mackinac Island. The autumn colors of red and gold and green blanket the island - while the crisp air reminds us the change of season is upon us. If you are not able to visit us in person this fall season, you can still enjoy the Best Fudge in America by ordering Joann's Fudge online. We offer 29 flavors, including a fall favorite, Pumpkin Pie Fudge. Celebrate 4th of July with Joann's Fudge from Mackinac Island! If you can't visit Mackinac this July 4th weekend, you can still celebrate Independence Day with delicious Joann's Fudge. We think our fudge is the perfect addition to any special picnic celebration. Fudge is easy to pack and stands up well, even in hot temperatures. Order fudge today and pack a sweet treat for your family this 4th of July! Joann's Fudge is the perfect Father's Day gift! Joann's Fudge makes the perfect gift for your #1 Dad on Father's Day. We have lots of #1 Dad's in our Joann's Fudge Family, but none more loved than Frank Nephew, who opened the first Joann's Fudge Shop on Mackinac Island in 1969, along with his wife Joan. Today, three generations work together to make Joann's Fudge America's Best Fudge Shop! You can order Joann's Fudge online for your Dad! Choose your favorite box size: one, two, three, four, or five slices - then pick from our 29 fabulous flavors. So even if you can't make a special trip to Mackinac, you can give the thoughtful gift of homemade, hand-paddled Joann's Fudge to your Dad for Father's Day! The 2016 Season on Mackinac Island has begun with the arrival of the horses and the opening of Joann's Fudge! The 2016 summer season on Mackinac Island has officially started with the arrival of Mackinac's favorite residents - the horses! - AND - the opening of Joann's Fudge! Aaron kicked off our sweet season with this beautiful batch of Chocolate Pecan. All over town, business are unpacking boxes, dusting off shelves, and putting the last finishing touches on winter remodeling projects. Most of the hotels and businesses will be officially open by Mother's Day weekend. Spring is a great time to visit the Island! You can explore all the beauty of Mackinac in a peaceful and serene setting. Spending the night here makes the visit even more special, where you can truly enjoy Mackinac Island from sun up to way past sun down. At Main Street Inn and Suites, the nightly turndown service includes a treat from Joann's Fudge - to hold you over until you can purchase more the next morning.